Towering Sweet Dreams Clown just loves laughing and playing with kids! 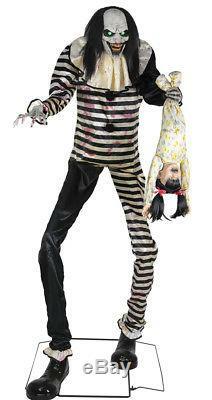 This intimidating 7-foot tall animated towering creep features an easy-to-assemble metal frame, long black hair, black & white striped costume and large black clown shoes. He has two creepy elongated hands, one of which is holding a small child by the feet! The Sweet Dreams Clown's eyes will glow with green glee and his head and torso turns side-to-side while he says one of 3 terrifying sayings "maniacal laughter", Oh look what I have here (child screams), a new volunteer for my juggling act! (child screams) Looks like I have a live one (child screams) - but not for long hehehe! (child screams)", "Wakey wakey, rise and shine sleepy head! (child screams) This should teach you to always look under your bed! (child screams) And in your closet hahah! (child screams) as the screaming child he's holding by the feet screams and flails about! Plug the UL power adapter into any standard outlet and choose from Steady-On, Infra-Red Sensor or Step Here Pad (included) activation options to operate. The infra-red sensor works up to 6.5 feet away and works in all lighting conditions - bright light to no light! Materials: 40% Iron, 8% PVC, 2% Electronic, 30% Polyester, 20% Cotton. For indoor or covered-porch use only. This clown might be available for your next birthday party - whether you want him or not! The item "HALLOWEEN LIFE SIZE TOWERING ANIMATED SWEET DREAMS CLOWN PROP DECORATION HAUNT" is in sale since Tuesday, September 11, 2018. This item is in the category "Collectibles\Holiday & Seasonal\Halloween\Current (1991-Now)\Props".